An estimated 27.4 billion disposable diapers are used each year in the US, resulting in a possible 3.4 million tons of used diapers adding to landfills each year. Did you get that? Twenty seven BILLION each YEAR just in the United States ALONE! That was too much for my little tree-hugging heart to bear. I had to know more. So, I started researching. I read about the effects of disposable and cloth diapers on the environment. I talked to cloth diapering moms, and tried to determine if this was a viable, sustainable endeavor for our family. The more I researched, the more I became excited about it and convinced that this was something I wanted to try. So, we took the plunge. I bought mostly GroVia and Flip diapers. Both of these are the "hybrid" or "cover/insert" system of diaper, which consist of a cloth insert and a waterproof diaper cover. The inner insert gets soiled and changed, but as long as the outer cover is clean, it can be reused. I like this system because it makes for less laundry than other "all in one" diapers where the entire diaper needs to be laundered after each use. GroVia diapers even have a snap-together system so the insert and the cover are sure to stay in place! In fact, all of our diapers are snap or velcro closures so there's not a safety pin in sight! WHAT DO YOU DO WITH THE P O O ? ? The answer is simple. You put it where it belongs: in the toilet. This is one of the great benefits of cloth for me, the poo is immediately flushed and not sitting in my house, where it will then be transferred to rot in a landfill somewhere. It is disposed of and then treated as it should be. I like that. I also use these awesome liners that "catch" the poo and are completely flushable (think of strong tissue paper). So when there is a dirty diaper I just take it to the bathroom, hold it over the potty, and flush. That's it! 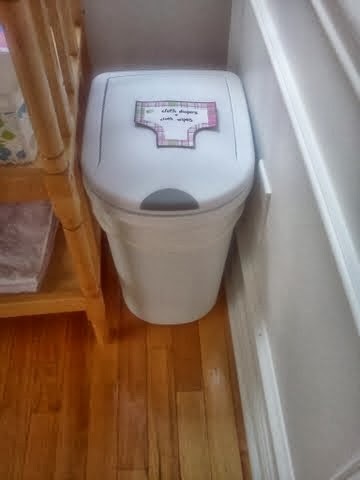 I use a regular old trash can with a lid for the cloth diaper pail, and then just dump the whole thing into the wash every few days. A drop or two of tea tree oil keeps any odor at bay. I actually like how it smells! I am a person who really hates doing laundry, so when I tell you it's not that bad, you can believe me. Otherwise I would have stopped a long time ago. I like to think that by implementing these few things, we are decreasing our family's impact on the environment. At least I know that our pile of diapers in the local landfill will be a small one. That said, there are times when we use disposables. If we're traveling it's a no-brainer, as well as when Shiloh goes to preschool. We also reached a point when she was 11 or 12 months old where we switched to using a disposable at night because of the sheer amount of liquid that needed to be contained. Who knew someone less than a year old could hold Niagara Falls in her bladder?! All in all, I love cloth. Some of the other benefits of cloth for us include a HUGE cost savings, a drastic decrease in diaper leaks and/or explosions, and the simple fact that they are downright cute. :) So, if you're considering cloth, please don't be intimidated. Give it a try! 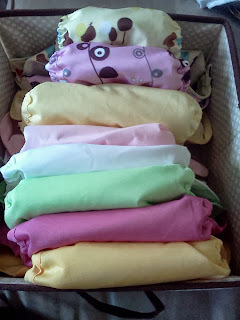 Reach out to a cloth diapering friend or a cloth diapering community. In Charlotte The Milky Way and The Baby Grocery Store are two fabulous places to get you started and each offer their own (free!) cloth diapering classes. There are also tons of online communities that offer support and even sell and trade diapers as well. I would also be happy to answer any questions you may have. Having said all that, however, cloth diapering isn't for everyone. Each parent has to make their own decision about what is best for them and their child, so no judgment here if you choose disposables. This is just what works for us. To each his own!